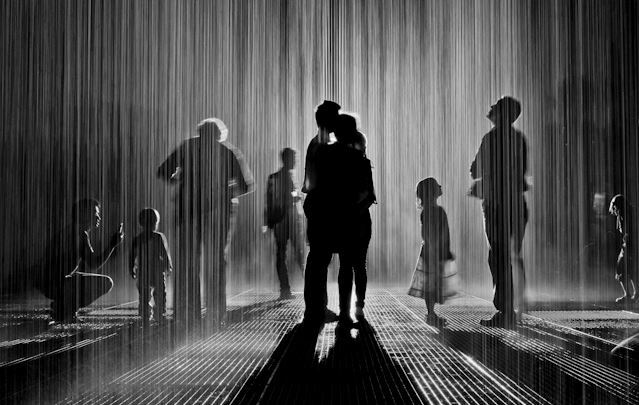 Now open for viewing at LACMA, the famous Rain Room exhibit by London based artist collective Random International. Walk through a perpetual downpour without getting wet! This amazing technology senses the body and stops the rain from falling in your vicinity while it continues to pour all around you. People have stood in line for hours to experience the exhibit in other cities.You can see it with timed tickets now through March 16, 2016 here in LA — but still expect a wait. $30 includes general admission to the museum. Buy tickets here. This weekend or any weekend between now and March 20, 2016 you can get up close and personal with some of the many many models representing the work of architect Frank Gehry. It’s like a wander through some sort of miniature land of the future where nary a right angle exists and buildings are more like super-sized sculptures than buildings. Yes, this is a model of a building, one that actually got built. And what’s nice about the show, videos of the built work accompany many of the models so you can see how it actually came to life, how it scales and relates to a real environment. Frank’s work is nothing if not stunningly emotional. Arresting even, especially in contrast to our mostly rectilinear world. In fact, i think that juxtaposition is what gives this work it’s power. Whether you are a fan of “object” buildings or not (admittedly some are more successful than others) there is no denying the genius of this man. It is well worth the $25 price of admission to sneak a peek into his world. And most interesting to hear in his own words and those of other creative geniuses across a wide range of disciplines, how and why he does what he does in a captivating film by Sydney Pollack. On the day i went, there were more people crammed into the little corner where this film is projected than viewing the plethora of models that make up the rest of the show. Say what that may about the show as a whole, just go. And then, because we are lucky in LA to be surrounded by a great many of his built works, take a drive around the city and see the buildings in person. Ando, Kahn and Johnson. The Modern, The Kimball and The Amon Carter museums, respectively. All located in Fort Worth, Texas a stones throw from one another. Each one a masterpiece. And now, you get a fourth for the price of three with a new building by Renzo Piano recently opened as an extension to the Kimball. I thought I’d died and went to heaven. Who cares about the art — although taking in a little Mark Rothko, Jackson Pollack, Francis Bacon and Donald Judd always makes me smile (a true modernist at heart) — the buildings are what I came for. Even the 90 degree heat couldn’t deter me. I could have sat on the concrete loungers, looking back at the silent power of three glass pavillions seemingly floating on water at the Modern all day. But that would have meant not sitting under the shade of a vaulted portico at the Kimball taking in the echo of cascading water and visitors footsteps as they navigated the grove of holly trees that act as transition from lawn, to courtyard, to vaulted building. The surprise of the day was the Amon Carter Museum. The first built in the area back in 1961. The original museum, a small but arresting monolithic structure, sits up on a hill before a stunning green space with views of Dallas in the distance. I couldn’t help but feel a bit of Acropolis reference. Quite the stretch for the Western art collection housed inside but true to form for architect Philip Johnson who also designed the 2001 expansion on the back side. If you are ever in doubt about the power of architecture on the soul, watch the documentary My Architect by Nathanial Kahn, son of Louis Kahn who designed the Kimball Art Museum (along with his mistress Harriet Patterson, mother of Nathanial). If ever a piece of film has moved me more I cannot recall. I wept and wept — not because of the personal story of an illegitimate son piecing together the life of an absent father who had three separate families and died unidentified in the men’s room at Penn Station — but at the sight of magnificent building after magnificent building. True artworks juxtaposing the geometries of built form and nature, in locations all around the world. All by one great master whose calling it was in life to build buildings. Great and powerful buildings. Buildings that will move you to tears. My neighborhood of choice this time around was South Yarra. The suburb with it all. Leafy streets with beautiful homes. Shops and restaurants galore. Every Melbournian establishment it seems, has an outlet in S. Yarra. Just two train stops from the city and bordered by some smaller more creative-type neighborhoods, you get the best of all worlds. It’s an easy spot from which to get everywhere. But then again, that’s one of the things I love about Melbourne in general — it’s so easy to get to every nook and corner. A small boutique hotel on a side street with a spa, a lovely lobby bar and friendly service. I’m not sure it’s everything it thinks it is but it was a pleasant place to stay with standard rooms that include small living rooms and kitchens making it more apartment-like than hotel like. A plus in my book. Best feature: Heated bathroom floors. Made Beauty Space, 39 Church Street, Hawthorne Do not pass go. Do not collect $200. Go directly to Made for the bestest, most relaxing facial experience of your life. Enough said! Ok, maybe not enough. It’s more than a facial. It’s sheer heaven in a heated chair — face, back, feet all get tended to and you’ll be simply glowing & floating on air when you leave. Ian Potter Museum, Swanston Street between Elgin & Farraday, Carlton A nice little museum that is part of the University of Melbourne showing everything from antiquities to contemporary art. Through July 2014, you too can see The World is Not a Foreign Land exhibit — an engaging look at 6 indigenous artists from different regions with a decidedly contemporary flair. Well worth seeing. Free admission. The Melbourne Museum, 11 Nicholson Street, Carlton — If you’re interested in learning about the history of Melbourne or seeing a living rainforest, or one of any sort of traveling international exhibitions, or even catching an IMAX movie this is your place. A large modern structure that sits in contrast to the World Heritage Royal Exhibition Center across the courtyard (open for tours when not housing an exhibition). $10 Admission. David’s Country Shanghai, 4 Cecil Place, Prahan — Traditional Chinese dishes & dim sum served family style in a beautiful space designed by one of Melbourne’s top interiors firms. White washed walls, a stack of blue and white bowls and a container of chopsticks on every table sets a decidedly casual and traditional tone. Unusual dishes like beef made with tea leaves dot the menu. I was there late on a quiet rainy night but can only imagine this place is loud and buzzing most days. Highly recommended and they deliver too. Tuck Shop Takeaway, 273 Hawthorne Road, Caulfield North — One train, two trams, nearly an hour in the pouring rain to get there. Completely and totally worth the journey. A tiny little burger joint with two tables, 3 counter seats and a school house theme right down to the Principal’s Office sign that leads to the back room. When I arrived it was empty. When I left there was a line out the door, rain and all. Voted one of the top burgers in Melbourne, they are large, juicy, messy (I must have used 50 napkins) and truly fantastic served with twice cooked fries and house made catchup. And for dessert, my favorite thing I ate this trip: Jaffa (orange chocolate candy) flavored soft serve ice cream. D.O.C., 326 Lygon Street, Carlton — I tried to get a table on my last trip with no luck. This time, we nabbed the last table in the very back corner late on a rainy Tuesday afternoon. And now I know why it is always so crowded. Simply the best bowl of pasta I have ever had. The Carbonara was good . . . But the Pomodoro was to die for . . .
Pinnochio, 152 Toorak Road, South Yarra — In my notes I wrote “Pizza close to the hotel seemingly California Pizza Kitchen-esque.” So imagine my surprise when the pizza was authentic and really really good. With so much on offer in the neighborhood, don’t write this place off. Jimmy Grants, 113 Saint David Street, Fitzroy — The hippest little restaurant in town just off Smith Street in groovy Fitzroy. And it just so happens it was the cheapest meal of my entire trip and among the best. Yummy souvlaki and refreshing feta, cucumber, mint & barley salad for two, $24. I could eat here every day, especially with my favorite gelato shop around the corner to cap off the meal. Bowery to Williamsburg, 16 Oliver Lane, CBD — Bialy, Lox & Cream Cheese only fancier: Beet and green olive bialy, dillweed schmear, cold smoked salmon with maxima (greens), capers and red onion. Everything I like but I wish I had substituted a bagel. Despite the not so authentic bialy, the combo was lovely in this New York inspired sandwich place tucked down an alley in the CBD. Their version of a Reuben is the number one seller and the portions are substantial by Aussie standards but thankfully, not in that NYC mile high sandwich kind of way. Part of the ongoing American craze sweeping the city but definitely with an Aussie twist. La Miel Et La Lune, 330 Cardigan Street, Carlton — A sweet little breakfast joint in Carlton full of students and faculty from the nearby university. I don’t know what it is but i always crave a good bowl of granola when I travel. This muesli hit the spot served with poached fruit and yogurt (although I’ll never understand the need for both milk and yogurt that seems to be standard in this part of the world). The kind of place you can cozy up to your computer and nurse a good coffee for awhile. It may seem like a lot of eating went on and that would be the truth. But what would be a trip to Melbourne without a little shopping as well. Having never ventured into Australia’s department stores before, this time I hit up both Myer and David Jones just to see what they were all about — typical department store fare. The big news in town was the opening of H&M that has taken over the entire GPO building. Just a few days in, lines were around the block with security galore. When you are in the neighborhood of Made Beauty Space for your facial (because you should go) there are two notable entries to check out: The Woodsfolk (gifts & homewares) & Maiike Store (baby gifts & a small collection of womenswear). Country Road — with shops around the city including in the department stores, there was a large flagship just down the road from my hotel at the corner of Toorak Road & Chapel Street. I’ve been partial to the home goods in the past but this time around, I spent some time in the apparel department. Style at affordable prices for both men and women. Kind of like the Jcrew of the Southern Hemisphere. Don’t forget, seasons are reversed Down Under. Greville Street, Prahan — This little area full of small independent shops, is a delight to just walk around and peruse. A nice alternative to the more chain ridden main drag, Chapel Street. Great cafes as well. The Fitzroy of the south with many second locations here in Prahan. A sweet shop with fantastical creations it is also a place to pick up the perfect food gifts for those back home. Pictured are the two things they are most famous for: Salted Caramel sauce and gold bullion bar chocolates filled with said salted caramel. There are oodles of fancy chocolates, jams and spreads, freeze dried fruit packets and fluffy meringues to choose from. That is if you can resist the lure of the pastry case. Oh la la! Et Al, 186 Farraday Street, Carlton — Every trip, I make one great find and Et Al was it this time. Unstructured, Asian-influenced, high style clothing designed locally by a male/female duo. The minimalist shop is located in a small stone cottage you could easily walk by without noticing, so keep an eye out. Many of the pieces can seemingly have a lot of fabric but look exquisite on. Other pieces that seem simple can be overwhelming. It really depends on your body. So try, try, try things on. I nearly tried on the entire shop but in the end settled on a coat and a sweater. A special shout out to the shop manager, Silvie, who was extremely patient with me and most entertaining to talk to. She graciously threw in a beautiful scarf as a birthday gift to me. How is that for an unexpected treat? And she’s made a customer for life. I’ll definitely be back on my next visit. Et Al also carries beautiful hand made shoes by Vietnam transplant, Phong Chi Lai. Expensive but works of art. In fact, he recently was included in the the much heralded Melbourne NOW show at the National Gallery Of Victoria. Rumor has it he may have moved to Tasmania and quit the shoe biz. But talent like this is hard to walk away from – or maybe that is wishful thinking on my part. I’m saving my pennies just in case.